Finally, we get a good jumping on point with the Gen 13 kids. Originally, issue 33 was supposed to be writer Phil Hester’s first but the story running through Wildcats and The Authority required writer Adam Beechen to take Gen 13 for issues 33 & 34 before we could get here. I can see why this was done but it has been hard to sell Gen 13 with a good jumping on point because of this. Thankfully, they finally accomplish that here. I was impressed with the latest issue of The Darkness which Hester wrote so I was eagerly anticipating him coming onto this book. We get the standard “Status Report…” at the beginning of the issue which lays out what’s happened so far in a very simple and direct way. 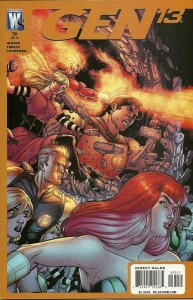 But Hester takes it further by having a new character narrate the majority of the issue. Plus, the roster for Gen 13 is finalized. Not all the original members are here. Some have ended up on The Carrier which is currently out in space while others apparently stayed behind with the remnants of the Wildcats. The rosters across all the Wildstorm Universe books have been mixed up. It’s a move that has fans split but I personally like it. It makes sense that all the chaos we’ve seen in the WSU lately would make it very hard for the teams to stay in their original incarnations. Likewise, these changes have had negative effects on some of the characters and that’s good to see. Some of these characters have been together for years and suddenly they’re gone. It truly is like a family breaking up. A new reader jumping on here will get the basic idea that the world has ended and it’s been that way for a while but they really don’t need to know much more than that to appreciate the story Hester has presented here. It’s got some Mad Max stuff going on and even a little bit of Resident Evil: Extinction (I think Fairchild kind of had a Milla Jovovich thing going on). Plus, Hester slows down in certain places and gives us some good character moments. A mix of quiet moments and action is what a good comic should be in my opinion. Finally, I must mention artist Cruddie Torian. This is his third issue and it’s amazing how his art improves each issue. It is so clean and crisp here compared to two issues ago. I’m really enjoying his art on this book and watching him grow as an artist. Overall, a really good first issue for Hester. I’m still frustrated that this is bi-monthly. I hope this creative team will bring some readers in so we can get this back on a monthly schedule. If you’ve been curious about Gen 13, give this issue a try. 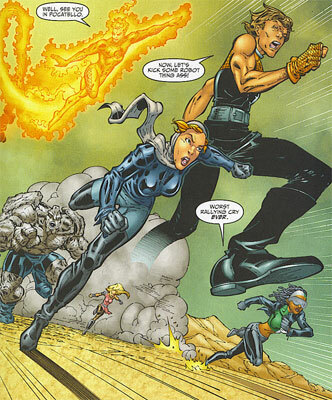 This entry was posted in Gen 13, Reviews, WSU and tagged cruddie torian, Gabe Eltaeb, gen 13, Pete Woods, phil hester, review, saleem crawford, scott peterson, wes abbott, wildstorm universe. Bookmark the permalink.